A rope led through a single block or pulley which offers no mechanical advantage but changes the rope's direction. A rope, plaited cord, or strip of canvas used to secure a furl sail to a yard or boom., the remainder a holystoning." On a square rigged vessel, a small square sail above the royal.....we have finished most of the hard work, we have painted the ship outside, scraped and oiled the yards and mast and holystoned the deck." Oct. 3: "After breakfast I mended a pair of pants then turned in. This afternoon I holystoned the wheel house and helped oil the skylight. The Capt. has concluded to have the main deck holystoned, they began this morning." 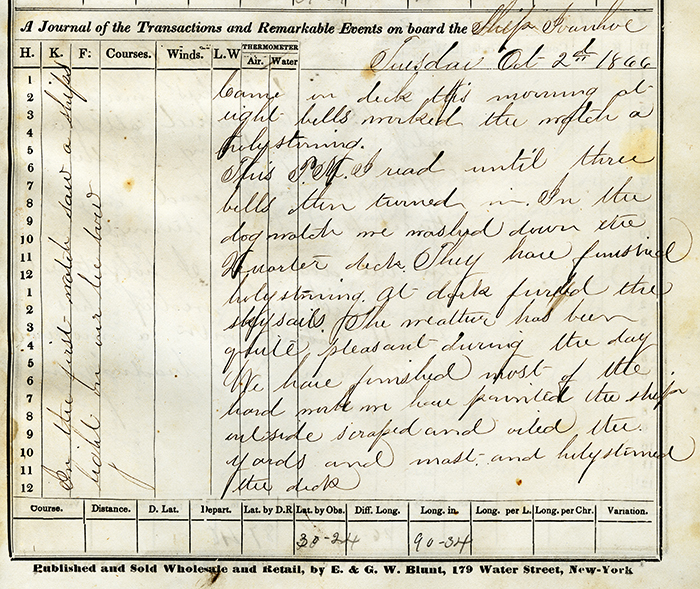 Oct. 5: "We have not headed on our course for several days, we are bound to get all the foul winds that blow." The person aboard ship in charge of provisions and aiding the cook. get breakfast. After breakfast I washed out our room, then turned in." The area on board a vessel where the ship's crew members gather to eat their meals. room. We expect to get in tomorrow, We have got a fine breeze."